Tasted at the property, the 2006 Château Pichon-Lalande has a voluminous bouquet with outgoing blackberry, cassis and violets scents, a touch of boysenberry jam tucked just underneath, although it does not quite have the delineation of the Lynch Bages. The palate is medium-bodied with fine tannin. This feels very composed in the mouth, quite fresh with well-judged acidity, harmonious and tensile on the finish. This deserves a higher score than I awarded out of barrel and it continues to improve year by year. Tasted April 2016. One of the most pleasant and unexpected surprises in this tasting, the 2006 Pichon Lalande is gorgeous, which is something I can’t say about too many wines in a vintage marked by climatic ups and downs and irregular ripening. Dark, powerful and intense, the 2006 possesses exceptional balance. A host of black cherry, plum, smoke, licorice and menthol flesh out in this decidedly somber, virile Pichon Lalande. In a vintage in which so many wines are so rustic, the 2006 Pichon Lalande is all class. 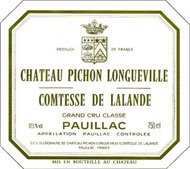 This sleeper Pichon Lalande will drink well for at least the next two decades, perhaps longer.